Dana II Modern Freestanding Soaking Round Bathtub 63"
Name: Dana II Modern Freestanding Soaking Round Bathtub 63"
Dana Modern Freestanding Soaking Round Bathtub 51"
Freestanding Modern Soaking Round Bathtub 63"
Dana II is a round soaking bathtub reinforces its appealing design as an exciting staple in any modern bathroom decor without compromising the relaxing look or feel of sheer classical elegance. The free standing bathtub round design will invoke a feeling of absolute luxury while offering a touch of modern elegance. Round bathtubs are often used to give a bathroom a bit of an open, warm ambiance. 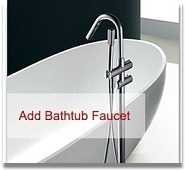 Also, home buyers often opt to use a round bathtub for bathroom corners. The Dana II modern round bathtub is a must have to add into every stylish bathroom.